Hydro Mousse is advertised as the world's first home hydro seeding system. 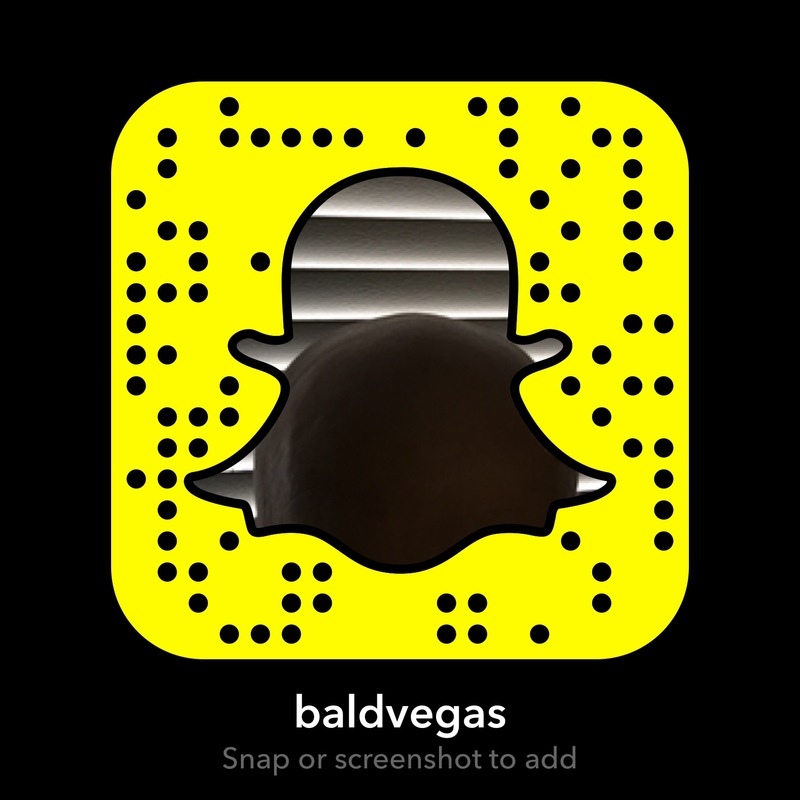 Here are my review and observations of the product and its advertising. Hydro Mousse is a spray-on seeding system which is advertised as a way to grow grass in areas such as dry spots, pet spots, and high traffic areas. Applying Hydro Mousse is said to be as easy as watering a lawn. The official website is hydromousse.com, which was registered in May 2013. It is marketed by Eagle Eye Marketing Group, Inc. Whereas seed can be washed away, blown away, or eaten, Hydro Mousse advertises a “Spray N Stay” technology which is said to overcome these obstacles. The product works by inserting a garden hose into the Hydro Mousse container, and setting the dial “seed.” The green formula is claimed to have two functions: visually helping you apply of the product, and in attaching the seed to the soil so that it will not move. 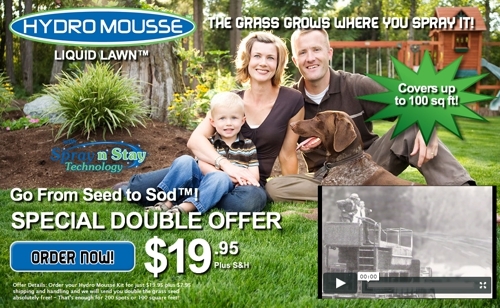 Go from seed to sod! The grass grows where you spray it! The world’s first home hydro seeding system! 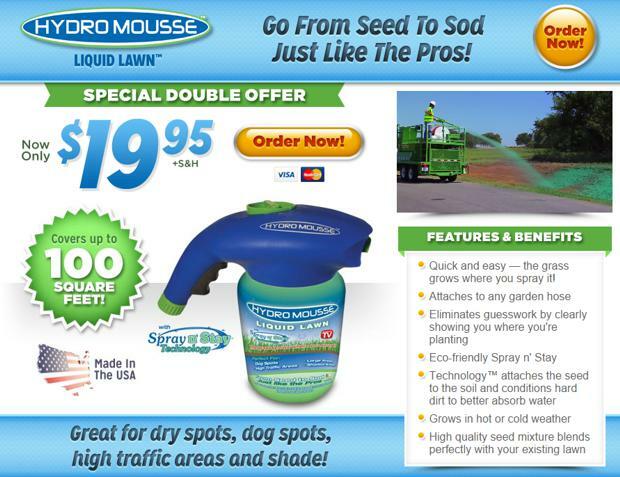 As easy as watering your lawn! Grows in extreme heat or cold conditions. Mixture includes perennial rye, Kentucky blue, tall fescue, and fine fescue. How much does Hydro Mousse cost? Hydro Mousse costs $19.95 plus $7.95 shipping, for a total of $27.90. This is enough for about 200 spots or 100 square feet of coverage. There is a 60-day money back guarantee, minus shipping costs. Shipping takes 2 to 4 weeks. As of 2016, the official website offers a “Pro Kit” which includes double the grass seed and 4 Hydro Mousse refill bags. This kit costs $79.80 plus $29.95 shipping, for a total of $109.95. A fifth bag is included free. I have yet to encounter anyone who has purchased this option. 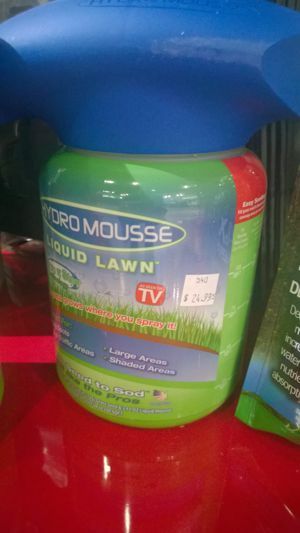 One reader wrote in an asked me, “Where can I buy Hydro Mousse Liquid Lawn?” As of mid-2014, Hydro Mousse became readily available in stores, as seen in the photo below. The photo above was taken at an As Seen on TV store in Las Vegas. That store was selling Hydro Mousse for $24.99. Below you can find screen shots of the official website in 2014 and 2015. The official Hydro Mousse website on March 30, 2015. This is the Hydro Mousse website in early 2014. Back in the 50’s, sod farmers invented hydroseeding as the easiest way to grow beautiful grass, but you’re still doing this. You want a great looking lawn but have dry spots, dog spots, high traffic areas, and shade. What a nightmare! You seed, water, and wait, but the only thing growing are the weeds. It’s no wonder. The seed gets washed away, blown away by wind, and eaten by birds. Not anymore. Introducing the revolutionary Hydro Mousse liquid lawn. With Spray N Stay technology, the grass grows where you spray it. Start growing with ease. If you can water your lawn, you can hydroseed. Simply attach to any garden hose and turn the dial to seed. Forget the guesswork. Hydro Mousse shows you exactly where you’re planting. The green mousse formula contains an eco-friendly sticky solution that attaches the seed to the soil and a conditioner to loosen hard soil, allowing it to absorb water, resulting in a terrific looking lawn. We sprayed Hydro Mousse on this vertical burlap wall, and look, the seed locks in place, even upside down. And the grass grows like crazy, even on a vertical wall. It grows in extreme heat or cold conditions. It’s perfect for dog spots, high traffic areas, large areas, and shade. And no more guesswork. Hydro Mousse includes a mixture of high quality seed that blends perfectly with your existing lawn. It’s never been faster or easier to get professional results at a fraction of the cost. So why pay a fortune for sod or seed the old fashioned way when you can get the complete Hydro Mousse kit for only $19.95 to bring your lawn back to life. That’s enough to do 100 spots or 50 square feet. But call now and we’ll double the coverage. That’s an incredible 200 spots or 100 square feet. And don’t forget to ask the operator for lot or acreage discounts. So don’t put up with this when you can have this. The advertising for Hydro Mousse has an As Seen on TV feel to it, and the company which markets it does not appear to be a major player in the lawn care industry. Your local Lowe’s, Home Depot, or nursery will likely have a wealth of appropriate lawn care products available for sale – without shipping costs or delays. At my local nursery, for example, I spoke with a well-versed salesman about the type of grass best suited for my area, along with his recommendations. He didn’t mention Hydro Mousse. Online reviews for Hydro Mousse are somewhat negative. Perhaps the largest pool of reviews is at Amazon, where readers give the product a meager 1.6 star rating after over two years and 500+ ratings. Among the various complaints about Hydro Mousse online, some customers have stated the the product didn’t work at all or that the seed washed away. Others have said that it didn’t cover as much square footage as advertised. As of 2016 it continues to advertise, despite lukewarm consumer reviews. Hydro Mousse has advertised on television and online for two years, although online reviews give it a sub-par rating. While the idea seems well-conceived, the implementation is largely a dud. You may be better served visiting your local nursery and discussing options with someone who is familiar with the soil and grass needs in your area. You may be interested in this comparison of Hydro Mousse with Cutting Edge Grass Seed and Grassology. Have you tried Hydro Mousse? Give me your review below.